Unlikely as it seemed just 18 months ago, Bethesda has become a major third-party supporter for Nintendo. When Skyrim was first glimpsed in the Switch reveal trailer, many assumed that a quick rejig of a six-year-old game was something of a polite gesture on Bethesda’s part, yet they followed it with the brilliant DOOM, and we’ll have Wolfenstein II: The New Colossus in our hands before the end of the month. Conversion wizards Panic Button have teased another Bethesda title in the works, and with the recent announcement of Fallout 76, there are hopes we’ll be seeing another ‘impossible’ port before long. In the meantime, 2015’s Fallout Shelter has become the first game in the series on a Nintendo platform, although it’s probably not the Fallout you’re looking for – free-to-play with countdown timers sped up via microtransactions. Don’t let that put you off, though; resource management is shot through with the series' dry humour and atompunk aesthetic, and the F2P elements aren’t too intrusive. As the title suggests, you are the overseer of a post-apocalyptic fallout shelter. Survivors turn up on the doorstep and must be assigned roles based on their attributes. The series’ SPECIAL stats return – Strength, Perception, Endurance, Charisma, Intelligence, Agility and Luck. These dictate which job potential inhabitants are best suited to: strong individuals should be put to work on the power generator; intelligent dwellers are better off in science/med labs. Appropriate delegation is critical to efficient production and morale. Optional tooltips guide you through the basics, although colour coding might have helped to make skills more readable. Joy-Cons can be used but the game is designed around touch or mouse controls. 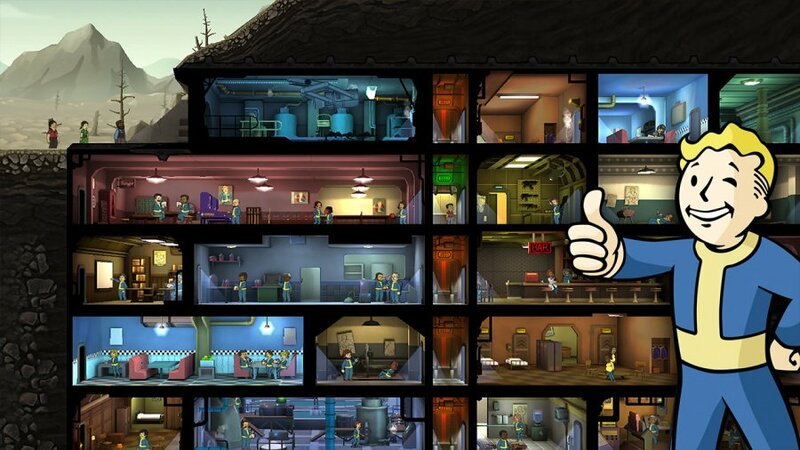 Harvesting resources and levelling-up your inhabitants with a tap earns you currency (bottle caps) which finances expansions to the bunker. New facilities gradually unlock enabling you to train your people in specific skills and improve productivity, which in turn attracts outsiders to your underground hotspot. Ultimately, you’ll be weighing the pros and cons of prospective candidates – if they don’t bring something new to the table, best send them packing. Power generation, food production and water filtration must be balanced to keep your vault operational, and consumption meters appear at the top of the screen. These are topped-up by tapping the respective room once their timers reach zero. It’s possible to ‘rush’ production, with success/failure rates giving as a percentage. Failure results in fires or roach infestations – other micro-catastrophes will occur periodically, including bandit attacks. It's when disaster strikes that frustrations arise on Switch. The game certainly functions on the small screen, but it’s crying out for the larger real estate of a tablet. Docking the console makes everything bigger, but you’re forced to use the cumbersome pad controls – a pointer would have offered the best of both worlds. In handheld mode, pinch-zoom works as you’d expect and you can double-tap rooms to get a better view. However, the frame cuts off the ends of wide rooms and dwellers run off screen as you’re trying to select them. Switch’s touch support provides some great gameplay opportunities if they’re tailored to the platform, but it doesn’t make a fantastic tablet. Dragging dwellers into different rooms is a hit-and-miss affair, mainly because they’re so small on the screen. Plummeting health bars and ticking timers exacerbate the situation. Inhabitants are 2D, but the bunker is presented as a 3D diorama so scrolling means dwellers in back corners are often obscured and navigation feels finicky. Visually, Vault Boy’s animated art style translates nicely and sound design is also strong, from the satisfying jangling of acquired caps to level-up jingles. There’s plenty of the series’ humour in the writing and scenarios, too. 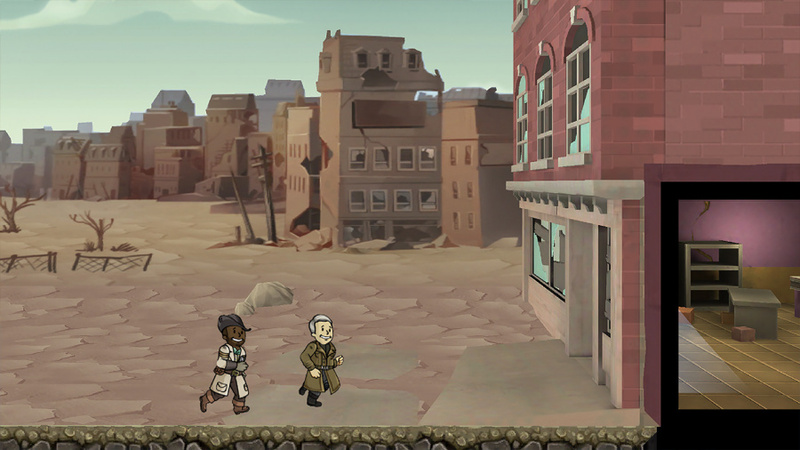 As well as recruiting souls from the wasteland, you play social engineer by dragging fertile dwellers into the living quarters and encouraging them to get along famously. You’ll know you’re on the right track when they start doing a little grandma jig. The game has its tongue firmly in its cheek, although it’s a shame to see pregnant women running hysterically at the first sight of a roach invasion. You’ll find or craft stat-altering weapons and outfits which enable you to send dwellers into the wasteland on reconnaissance quests and track their exploits via text updates. Once you unlock the Overseer Office, you can follow these quests. Bottles of Nuka-Cola are used to hasten journeys – these are found in the field, as rewards for completing quests, or in special lunchboxes (Fallout Shelter’s version of loot crates). As microtransactions go, the system is relatively unobtrusive here. If you’ve got more money than time they’re certainly tempting, but the game does provide resources over time so it’s still enjoyable provided you’re not in a rush. The timer-based gameplay is made to be dipped into a few times a day, and while this works on Switch, it was evidently designed with other devices in mind. Yes, touch functionality exists, but the experience on Switch doesn’t compare with dedicated phones or tablets, and if being able to play on the bus isn’t a concern, the PC version would be better still. 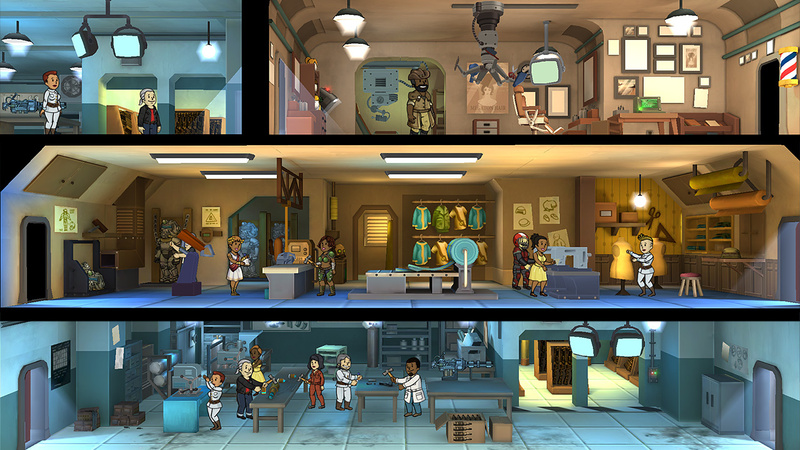 Fallout Shelter is handsomely presented with a nice resource management loop that’s worthy of investigation, but it’s tough to recommend this version if you've got access to other platforms. I couldn't get into this at all. Thanks, but no thanks. 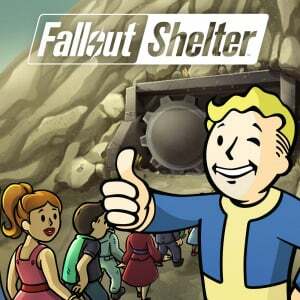 In regards to Fallout, I would prefer if the Switch got something better than Shelter. Fingers crossed that Panic Button is working on a Fallout port. I've been playing this a fair bit as I enjoy the dip in and out play of it. Took a little while before it became engaging (my Shelter is pretty big now), and quests being available spice things up. Found the touch controls can be a little annoying especially when trying to assign people to rooms, but beside that its been a nice little addiction. I will NOT try Fallout Shelter even if I am a fan of the modern Fallout games. I despise mobile game ports on gaming consoles even if they are free. I hope that with this they are just teasing the Fallout port. I don't even like mobile games on mobile devices, let alone full consoles where they have to compete with games like Mario Odyssey for my time. Got kind of excited when this came to Switch as I don't really play games on my phone however after a few days of dipping in and out I find it's far to slow without the micro transactions so I've already deleted it. Same with Pokemon Quest, that's long gone as well. A game where you are AFK so not adapted to the Switch ! Yeah, I would agree with that, I really don't want a whole lot of mobile games on Switch. If I want mobile games, I'll just play them on my phone or tablet. If we get a real Fallout, I won't care as much, but if this is the only Fallout thing we get, it'll be very disappointing. Fingers crossed Panic Button is working on a port. We know they're busy working on something for Switch. Granted, we don't know if it's from Bethesda though. Played it on Android. It's like Pokemon Quest, you need several short sessions to progress in the game. If you are playing another game at the same time, you can't just leave your Switch on sleep mode like I always do. You have to constantly save, close the game, load Pokemon Quest, play for 10 minutes then load your other game again. I've played this on iOS and XB1, so I nabbed it to get a fix on my switch during sanity breaks at work. I was hoping to be able to turn off the "3D" depth so rooms would be flat, but it's not present in this version. I downloaded it on to my Switch and gave it a few hours playthrough this weekend. I may come back to it from time to time but overall, it's nothing that special. I am interested in Fallout 76 though and I was hoping that game would be ported over to Switch. I haven't played any Fallout games, Shelter is actually my first go at the series. But the E3 content for Fallout 76 pretty much sold me on the series. But I'm going to hold off on getting the PS4 version in case Bethesda figures out how to get the game running on Switch! I tired of this game rather quickly when it came out originally. Didn't get to see if there was any kind of end game surprises. "The game has its tongue firmly in its cheek, although it’s a shame to see pregnant women running hysterically at the first sight of a roach invasion". No, it isn't a shame, it's just hysterical. I tried Pokemon Quest for my free casual game for the commute or for some downtime before I go to sleep, but even If I regard myself a Pokemon fan I prefer playing Fallout Shelter. I have never played any Fallout game but I love micromanaging a city or a shelter in this case, sending my troops on quests and upgrading shelter's facilities. Deleted this game after about 15 minutes..
You know I like you Bethesda but just because Switch could be a handheld also doesn't you have to give us this garbage. A simple port of Fallout 4 would had just been fine, I'm not even asking for a port of the newer game either. Just Fallout 4 and you failed me. @retro_player_22 I doubt they would be able to get Fallout 4 running to a good standard on switch sadly. Fallout 3 yes, 4 no. Game chugged on PS4 and Xbox one. I’d take Fallout 3 for sure. @Mr_Pepperami I second that regarding 3. Love that game. Crap, unintuitive controls made this virtually unplayable. Got sick of waiting for the Switch to play this so I'm now playing it on my phone. This game is a waste of time, literally. You have to wait around for things to happen, combat has little no control and the controls are crap. Don't bother. I've been playing quite a bit of Fallout Shelter but there are some major issues with the game. The biggest of them is that the game always crashes when trying to build the overseers office. That makes it impossible to progress very far because you can't do quests without it. I've reached 80+ dwellers but without the quests you can't get the bonuses and they all end up being killed by roaches. @CaPPa I didn't experience any crashes - you've been patient to get to 80 without bonuses! The touch screen controls are iffy. but workable. however, using a controller feels pretty good for a mobile game. even thought having a mobile port that requires time in between play sessions to make any real progress, the boot-up time is pretty quick, compared to my other drop-in game right now, Battle Chasers Nightwar. 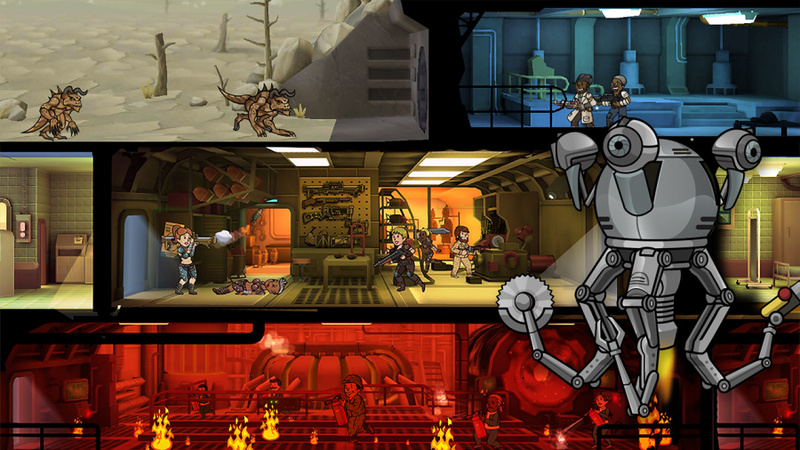 I find myself dropping in to Fallout Shelter 2-3 times per day. the only REAL downside I can find gameplay wise, is when you send people into the wasteland, save, quit, and don't boot it up until the next day, my explorer is almost always dead. I wish there was a better way to deal with this other than wasting precious bottle caps. Overall I think I'd give it clover to a 7.5. I haven’t played this yet on the switch but I did play it extensively on my iPhone and iPad a few years ago. I don’t understand how the touch controls on the switch could be different or worse than an iPhone. I had no issues playing on an iPhone 6s Plus and the Switch has a larger screen. I think the game is a welcome edition to the Switch library. This is better suited to mobiles. Picking up a game to play 5-10 minutes here and there is something best suited to a phone as you always have it in your pocket. Played it on my phone and enjoyed it for a few days then it became stale for me. BUT Bethesda are giving the Switch great suport so I can’t really knock them, especially as this is free to play. I noticed too that when the Switch is in sleep mode and the game it still running, the things in the game keep ticking along. I turned it back on the morning after my first night playing it, only to notice all my meters were in the red and my wasteland explorer had died with no one to call him back home. That, and the tutorial is the barest bones as you get. It tells you a few ways to get around the bunker, but that's it. Then it gives you tips which may or may not be relevant at the time, so you'll forget about them until the time you need them. I dunno. I haven't had a good time with this so far. Maybe, as the review says, this experience is better tailored to the tablet. I've been playing fallout since the 1st one. I can deal with some of the hiccups, but I feel like every time I go to 'rush' something even with a low 20 something %, I fail almost ALL the time. Is it just my miserable luck? It's not that it's bad this is on the Switch, but I'm not sure why you would choose to play such a simple game on anything but your smartphone. Also, as someone who played this game on their smartphone a while back, at some point your vault either becomes too hard to run without the robot that automatically collects resources for you, or self sufficient because you have enough robots that automatically collects resources for you. Wait, Panic Button’s next game was confirmed a Bethesda game? I mean, there’s little reason to doubt that is considering past releases, but it’s really been confirmed? It's a mobile game. I am playing it as a small time waster because it is free, but I doubt it will hold my attention for long. I will give it another week, but I don't see myself playing beyond that. Surprised to see so much negativity. I think it's fun. Won't be spending any money on it though. I downloaded it and play it for over 10 hours now. Love it so far. So many nice ideas and humour. Even if it´s F2P and there are microtransations available, you are not dependent on it nor is the gameplay balanced to force you in this direction. IMO you can progress easily without spending any money. The game is a F2P-mobile game in its heart. But I like it for its art style, humor and micromanagement of building your own underground city. Now I am waiting for Project Highrise. I actually like Shelter for what it is. It might take a couple of tries before you find out how to build an effective shelter but then it's pretty rewarding. I play on the PC though. no cloud saves! come on! I enjoy the game on Switch more than I would an my phone. I don´t see why it is suited more for phones than a mobile device like the Switch. My partner and I have been enjoying this game way more than expected. Far from perfect, with some really frustrating moments of bad luck, I suppose (when 20-30% fail seems to always end up failing, random attacks happen at the worst imaginable times,...), and far from perfect touch input recognition. But I didn't expect an overall enjoyable management game, as I usually don't like that kind of game to begin with, and it's free when, like me, you choose not to pay for it. Still on my first vault, no deaths, and it's getting massive. Not sure if it will hold my interest for much longer, but I'll have enjoyed it for what it was, at the cost of absolute zero. Well I played it on my phone for a bit so I've been giving it a go now. @Mr_Pepperami Nah it'll work, anything is possible, the game will just not play the same as on the other platforms cause the Switch is nothing like the other platforms. I had the issue on 2 different saves, when I'd try to start a quest it would leave the hint screen on top of the entire screen and it wouldn't go away; completely ending my game. Thankfully on my 3rd save it has worked ok and I can now do the quests. 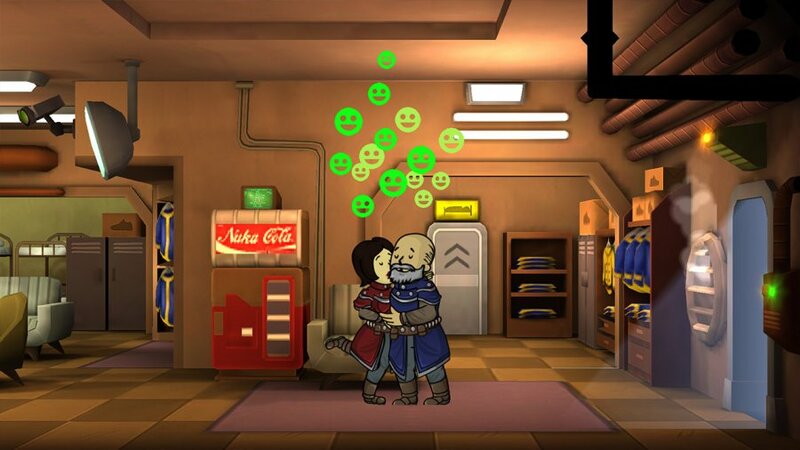 The extra Caps and bonuses certainly help; as now I can go over 100 dwellers with ease. The first week this game was really nice building up the vault, renaming characters and grow attached to them. In the second week I just have my people train in the 7 SPECIAL training rooms, because sending them out resulted in finding very hard ruins that I couldn't survive. It's quite a drag having to wait for days until you got a handful of good characters. I hope I have at least 4 highskill warriors ready soon, one to send out to the wasteland and three more for sending on quests. I wasted ten thousands of bottle caps restructuring my vault though, wish I would have known some of the games mechanics earlier. Are these Mr. Handy (collectors) only available via buying, or is there a way to get them in-game? This has been fun... worth a look, but would rather have paid something instead of it being almost solely based on microtransactions...have not paid tho.